Can’t believe Switch sales are down 9 units this week. Nintendo is doomed. So for some informed commentary, Switch HW staying flat after Smash's great launch is crazy good, Biggest week of the holidays is week 51 next week. Switch software increases, especially Mario Party are insane. Smash hold is great. whats with those nintendo software bumps? jesus looking at that entire list i'ts pure nintendo games. crazy switch sales. really good ps4 sales. switch is gonna over take ps4 next year in japan? Yeah, just amazed that sales remained at 99.997% of last week’s. I doubt we’ve ever seen w/w sales change that little. Jeeze the switch is already on it's way to surpass the PS4 in Japan. If it manages to do that before it's second year of being release that would be insane. 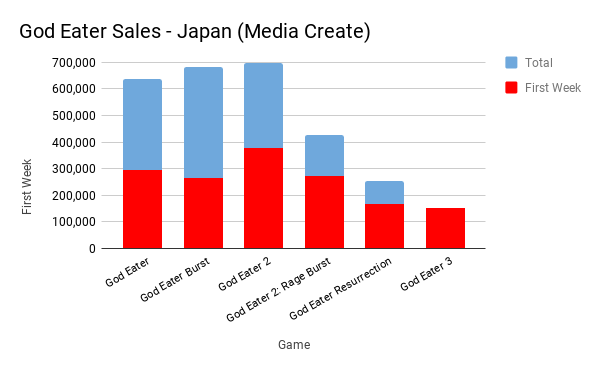 I mean, obviously not passing it in WW sales, but Nintendo taking back Japan in less than two years would be impressive. Yep! Switch is a beast in Japan. It looks like the PS4 will get to the 10 million unit sales mark sometime in 2020 and then probably just stop selling. Lol, down more than 50% from the second game as expected. Moronic decision to not also released the game for portable system. Not to mention based from the buzz, the game is more focused for fujo/otome/gay market as while you can create male/female avatar but the story and interaction is both the same (pandering to straight female or gay male) as your group have one annoying party member (male) who constantly wanting to flirt with you. Way to go to destroy the GE gaming franchise by pandering to another demographic which not yours to begin with. I enjoy these threads at this time of year it reminds me of waiting to get my hands on a SNES and Street Fighter II from Santa. 3DS beat PS3 in less time. 9.6M by end if 2012 in JP so it's not unheard of. (3ds launch years were fantastic. 3rd best year ever in 2012 at 5.6M. Only DS beat that 2 years at 8M and 7M, which is even more insane). Big difference though is that Switch is selling very well at a much higher price. Updated with full numbers (MC Top 50, Famitsu & Dengeki). Any thoughts on the recent DQ11 Switch trailer? Switch barely holding levels, while the xb1 jump is nothing short of mind-boggling!